The mining activity in Peru is of long standing and its existence begins with the times and cultures pre Incas, Inca, colonial and the own Republic. This is due to the existence of deposits and important mineral resources distributed throughout the Peruvian territory. This paper reports a study focusing sediment profiles (LKS-1, LKS-2 and LKS-3) and water samples collected in Ramis River that is located in Ananea District, Puno Department, in southern Peru at the northern section of Titicaca slope. 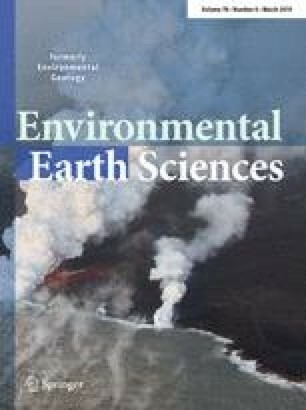 The CF:CS 210Pb chronological model allowed determine sedimentation rates useful for evaluating the history of the heavy metals contamination over the past 150 years in that mountainous area of the Peruvian Altiplano. The maximum concentration of As, Cr, Cu and Zn was, respectively, 400, 93, 93 and 20 ppm (LKS-1); 120, 95, 98 and 20 ppm (LKS-2); 98, 98, 87 and 40 ppm (LKS-3). Two linear sedimentation rates were identified in each profile along Ramis River: 0.14 and 0.15 cm/year (LKS-1); 0.33 and 0.21 cm/year (LKS-2); 0.31 and 0.24 cm/year (LKS-3). The respective deposition times were: LKS-1 = 76 and 177 years; LKS-2 = 85 and 130 years; LKS-3 = 86 and 144 years. Possible events related to the different rates would be the degradation of the native forest by anthropic actions, characterized by the activities of overturning and burning to carry out forest plantations, as well active processes taking place in the region like the urban growth. The authors thank CAPES (Coordination for the Development of Graduate People) in Brazil for the scholarship to FRMM, as well UNESPetro for the infrastructure access. Two anonymous referees are greatly thanked for very helpful comments that improved the readability of the manuscript.